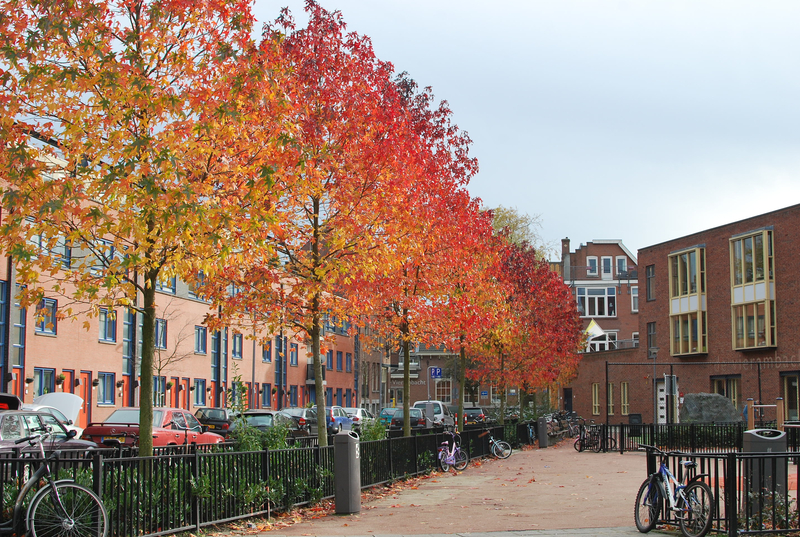 Vierambacht is an area at the heart of the Nieuwe Westen district of Delfshaven in Rotterdam. The name of the area translates as four trades, but whether a reference to butcher, baker, candlestick maker, or some entirely different trades, I know not. The district of Nieuwe Westen is a mix of old, stately buildings complete with bay windows, stained glass and gargoyles on the Mathenesserlaan and along the Heemraadssingel, and other streets of bland and modern box housing. The photo below shows what I suppose would fall into the category of modern box housing. Hardly anything memorable about it, except that row of small maples bordering the playground of one of the local primary schools, De Vierambacht. The area has absorbed a lot of immigrants from outside Europe including the Caribbean, Turkey and Morocco. I’m not sure of the numbers, but from observations over nearly two years, I would venture to say that at least 70 per cent of the population of roughly 19,000 is not butter-Dutch. In practical terms, this means that there is a good supply of stores selling all the spices, herbs and vegetables required for just about every cuisine under the sun without charging a premium for exoticism. Enjoying a simple lunch at a café in the neighborhood today, everything pleased me from the plain and tasty pumpkin soup, to the pale November sun, and the flow of conversations in Dutch, English and Italian around me. Sometimes Rotterdam shines. Lovely post. It cheers and gives you hope that there can be a multi-cultural environment that lives at ease with itself. And that is heartening in this period of economic worry and threat for so many worldwide. Your prose shines here, too, Lis-Britt.